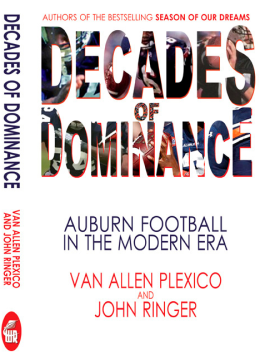 “Decades of Dominance: Auburn Football in the Modern Era” is written by your TWER friends Van Allen Plexico and John Ringer. They write columns. They record podcasts. They write books. 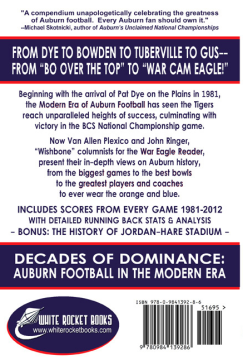 They’re here, now, in 311 pages (including appendices and references) to convince those that have forgotten, not realized or would like to conveniently misremember just how big a cog Auburn has been in the SEC and on the national scene in this, the modern era. They’re very precise about that. The modern era starts in 1981, when a gruff talking man from Georgia came back to this side of the country after a sojourn in the west, making gameday hats popular and generally making the other team’s quarterbacks and running backs miserable. Plexico and Ringer define the modern era selectively in this sense, but they define it well. Those days were the beginning of a fluid period, the departure of Bryant and the rapid ascendency of Bo. Things were changing in college football. Auburn would soon go from the wishbone to the I, everybody just seemed to be hitting harder and there were no orange jerseys in sight. Plexico and Ringer are Auburn men, to be sure, but here’s how you know this book is going to be worth your time: There are facts everywhere. This isn’t afternoon drive time call-in banter because you remember a play that happened in the rain in 1973 in Knoxville. Plexico and Ringer bring the empirical data. It starts in the introduction, for Aubie’s sake. Soon you’ll be recalling where you were when you heard the tape that changed everything and when you listened to The Streak in the 1990s. They’ll evenhandedly walk you through the fall of the Bowden era, one of the true lulls the book has to cover. You’ll be sucked into “The Rise and Fall…and Rise and Fall… of Tommy Tuberville,” a period that started, they’ll remind you, with a five win season before establishing some of the most impressive numbers in Auburn’s history, no matter what period we’re talking about. They don’t sugarcoat Jetgate, but this is a football book. You’ll drum up your own arguments to compare to their list of games that should have been played at Jordan-Hare Stadium. There’s going to be a sad few moments in the six pages spent reliving costly losses and, armed with the numbers in this book, you can finally you can settle the discussion among your friends among the best team to wear blue and orange. Every TWER reader, bright connoisseur of Auburn history that you are, will love the rich, deeply researched chapter on Jordan-Hare Stadium, which stands as one of the better valentines to a Saturday cathedral. Then you’re going to read, at pace, the chapter titled “The Gus Bus and Beyond: The Future of Auburn Football.” If you’re still looking for something to get you through the period between A-Day and two-a-days “Decades of Dominance: Auburn Football in the Modern Era” should earn some attention. Decades of Dominance: Auburn Football in the Modern Era is published by White Rocket Books. 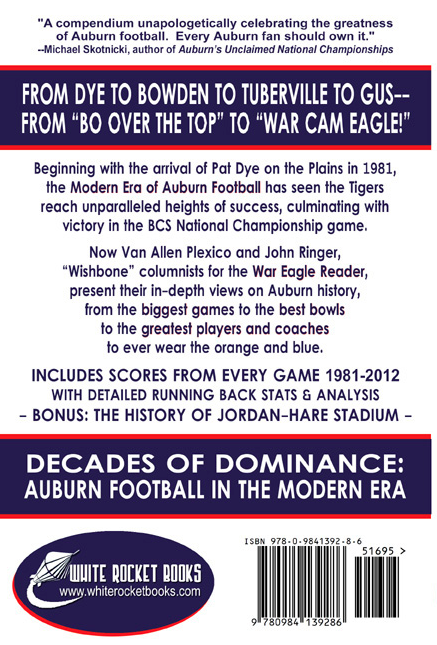 The Auburn University Bookstore in Haley Center will have copies on sale this weekend as a special for A-Day. The book will be officially available to order May 23. We’ll keep you posted. Related: Season of Our Dreams: TWER writers turn column into book on AU’s championship run. Just picked up my copy – can’t wait to read it!